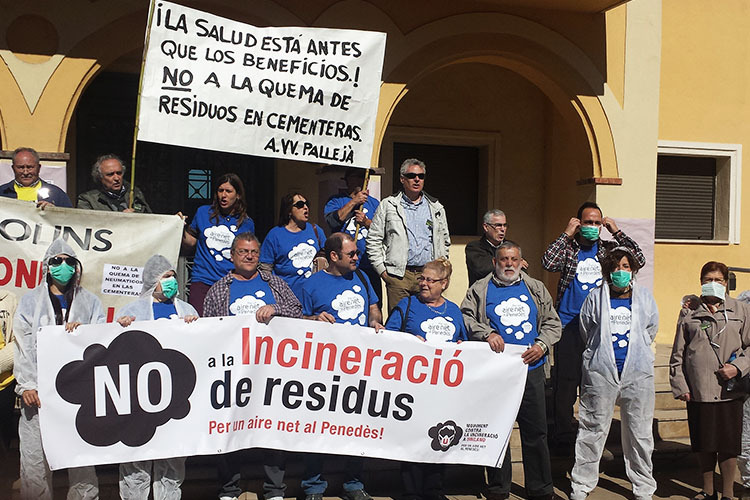 The 6th Spanish Gathering Against Waste Incineration in Cement Kilns took place the last 13–15 of March in Vilafranca del Penedès (Catalonia, Spain). It was organized by the Movement Against Waste incineration in Uniland – a cement company that started burning tires in the cement plant located next to Vilafranca del Penedès in 2010, raising huge concerns at the local level. The gathering was a success of participation, with more than hundred people attending the morning conferences and representatives from over 25 platforms against waste incineration from all over Spain. “The purpose of the morning conferences was to share the latest scientific and medical information on the effects of waste incineration on people’s health and the environment”, explained Mercè Mestres, one of the organizers of the gathering and founder of the Movement Against Waste incineration in Uniland. All presentations confirmed, once again, that burning waste and by-products in cement kilns is the most untenable and dangerous form of handling waste. On the basis of the latest peer-reviewed papers in the field, the experts agreed in considering emissions related to waste incineration in cement plants as a health hazard for people, animals and plants, soils, air and water. Dr. Eduard Rodriguez Farré, medical doctor and professor at the Institute for Biomedical Research of Barcelona, presented the results of two peer-reviewed papers elaborated by the Health Institute Carlos III in Madrid and recently published in international journals. The paper published in January 2013, “Cancer mortality in towns in the vicinity of incinerators and installations for the recovery or disposal of hazardous waste” concludes that there is a statistically significant increase in the risk of dying from cancer in towns near incinerators and installations for the recovery or disposal of hazardous waste. The second paper elaborated by the same research group, published in January 2015, and titled “The cancer mortality in towns in the vicinity of facilities for the production of cement, lime and magnesium oxide”, detects as well an excess of all cancer mortality in the vicinity of these installations as a whole and, principally, in the vicinity of cement installations. “We must insist that in an area like the Penedès, where the economy is based on the vineyards and the production of wine, this polluting practice can be very damaging to the local economy, as the pollution will show up in the final product, the wine”, said Dr. Rodriguez Farré. “We have enough data to be concerned about the increase of certain types of cancers, endocrine disorders, disruption of brain development and cognitive functions in foetal process resulting from waste incineration”, he concluded. 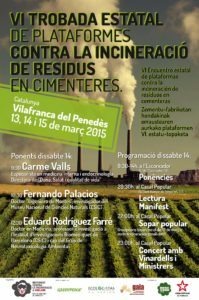 6th Gathering of the Spanish Network against waste incineration in cement kilns in Vilafranca del Penedès. Dr. Carmen Valls, specialist endocrinologist and Director of the Public Health Program “Women, health and quality of life” unveiled the results of a survey conducted in early 2015 in the regional Hospital of Vilafranca del Penedès, in which the healthcare professionals detected subjectively an increase of cancer rates in the county. Vallès also provided detail about the short-term effects of waste incineration, mainly looking at in thyroid alterations, decreased sperm production, and increased congenital diseases, among others. The development of tumours and cancers were considered long-term effects. Dr. Fernando Palacios, researcher at Spanish National Research Council (CSIC), presented about the economical impacts of waste incineration in cement plants, focusing on the damage made to public health during 2011. Palacios explained that according to data from the European Environment Agency, 6 cement plants in Spain were amongst the 622 most polluting facilities in Europe. For these plants, Palacios presented figures for the loss of life expectancy in the surroundings of these plants, which would represent an economical cost ranging between 45 million EUR from Lafarge SA in Villaluenga de la Sagra and 70 million EUR in the cement plant in La Robla. The final result stressed that the loss of life expectancy implied a cost of 319 million EUR for the public health systems as care for diseases resulting from this potential contamination. The review of environmental authorizations given to the cement plants for the use of municipal solid waste, industrial waste and Refuse-Derived Fuel as combustion fuel. The undertaking of epidemiological studies in areas where cement plants are already burning waste as fuel. The implementation of healthy and sustainable waste management plans that aim at zero waste, as a main goal and guiding principle. Do not political support to political parties that appear to be in favour of waste incineration, specially looking at the coming municipal election in May 2015. The Gathering was reported in the regional TV and local newspapers, see here and here. Do not miss the complete debrief of the Gathering in this brilliant video made by the local organizers.